On 17 August 2017, the President of Guatemala’s National Congress, Oscar Stuardo Chinchilla, along with members of Congress, and the Executive Director of the United Nations World Food Programme (WFP), David Beasley, signed a commitment to end the scourge of malnutrition across the country. 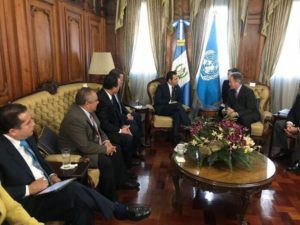 Since joining the SUN Movement in 2010 as an “early-riser country”, Guatemala has made strides in its efforts towards addressing the underlying causes of malnutrition. Stunting, which currently affects almost half of Guatemalan children, deprives the country of important human capital. For this reason, the high-level commitment demonstrated by Congress will play an important role in maintaining nutrition high on the national development agenda. David Beasley, Executive Director, World Food Programme. The Strategic Review of Food and Nutrition Security Situation in Guatemala, prepared by the Research and Social Studies Association (a local think tank) with the support of WFP, highlighted the importance of addressing chronic malnutrition and its root causes if Guatemala is to reach the Sustainable Development Goal 2 – Zero Hunger. The report revealed that the people most vulnerable to food insecurity live in the regions of the North, Southwest and Northwest. These areas are rural and are mainly home to indigenous groups.